Today I’m delighted to welcome Carrie from Eyeliner on a Cat, who has been one of the loveliest supporters of my Project Perfume this year, and writes evocatively about her scent collection on her own blog, she’s created a new lemming for me now with this one …. Today was one of those amazing mornings. I woke up to a surprise care package filled with perfume goodies from a friend in Austria (I’m looking at you, Olfactoria!). Inside were many things I’d never tried before, even a couple of those Serge Lutens wax sample books I’d been wanting to see for quite some time. 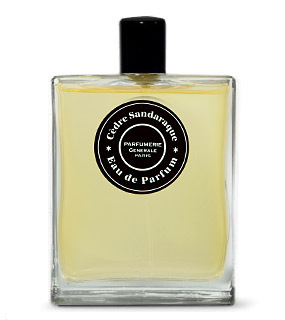 The one sample I sniffed and immediately had to try on my skin was Parfumerie Generale’s Cedre Sandaraque. I’m familiar enough with the house to know that it was going to be a slam dunk right away. The opening speaks clearly of spiced, chewy steel-cut oats, lightened by crisp vetiver- a brilliant move. I really love it when perfumers use inventive complementary notes together. So right off the bat, I’m surprised, and that (almost) always bodes well. There is a beautiful, laser-cut sharpness of cedar backed by the resinous spices. Cedre Sandaraque offers excellent contrast of shapes and shadows; round vs. angular. Here’s where the mysterious nature of this perfume really starts to develop. The sillage is quite different from how it smells up close. When I sniff my wrist, it’s intensely spicy and sharply woody, camphorous resins abound. As you walk, you leave more of a gourmand trail behind you. Fascinating! I cannot recall another perfume where this is the case (if anyone can name one in the comments– please do!). There is somewhat of a boozy effect when the notes are all combined, with a medicinal quality to it, I’m very attracted to that. “It smells like medicine, so you know it’s working!” It reminds me of what the town medicine man might mix up for a poultice. The nutty quality of the praline is very rich and toasted, but it never dominates (and I’m glad for that). I don’t recognize amber here in any traditional form, but perhaps it’s best represented as a “green amber”. The spicy resin gets more intense the longer it sits on my skin, and threatens to singe the nosehairs with the fumes. This is not a bad thing for me, believe it or not. I love to eat hot, spicy salsa, I enjoy the burn. It’s nice to have a perfume like this that doesn’t use pink, red or any other kind of pepper in the notes. What a relief! I am thoroughly peppered out in fragrance. The gourmand aspect does fade significantly as the drydown approaches, and what’s left in the final hours is that big, bright cedar note, delicious spiced resin and the fresh, verdant element of vetiver. I’m thoroughly impressed with Cedre Sandaraque, it’s one of those perfumes that really needs to be smelled to be believed. Olfactoria told me that I would like it very much, and she was right on the money. It’s worth seeking out for it’s unique nature alone: come for the freak show, stay for the churros. I've never heard of this brand but this sounds like a really interesting scent.Will have to try and seek it out. You captured Cedre Sandaraque amazingly well, although on me it is not nearly as spicy hot. Very interesting. If you can believe it, I have not yet met a Parfumerie Generale scent that I do not like; that says a lot! Cedre Sandaraque sounds right up my alley (cereals, vetiver, resin, and of course cedar)—can this house do no wrong?? Love the review! Thank you Carrie! Thank you ladies! Birgit, you are getting to know my tastes well, and can predict them sometimes before I can! Cedre Sandaraque was a total surprise to me, I didn't expect it to be as potent and original as it is. It's one of those perfumes I'm always going to tell people "You just have to smell it for yourself".